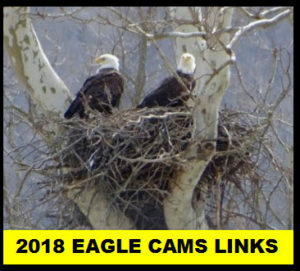 The Game Commission’s mission is to manage Pennsylvania’s wild birds, wild mammals, and their habitats for current and future generations. The agency is funded by hunting license sales and federal taxes on ammunition and firearms, not by state tax dollars. Hunting licenses support all wildlife, not just game. The Game Commission hasn’t had a license increase since 1999 when a general hunting license went from $12 to $19. Marcellus Shale money helped bridge the gap in our funding until now; those funds are now dwindling. As sportsmen and women, we know that hunting and trapping are not only vital to the state’s economy, but of utmost importance to everyone concerned with the future of wildlife management in Pennsylvania. How will a license increase make a difference? As your wildlife agency we will be able to continue to purchase lands, to manage habitat that will benefit our native birds and mammals, and continue to protect our threatened and endangered species. Legislation has recently been introduced that would allow the Game Commission Board of Commissioners to set license fees, and remove funding for wildlife from the legislative process. If you’re concerned about the future of wildlife conservation in the Commonwealth, we request that you contact your state Senator and Representative and ask them to support Senate Bill 1166. Find your local Senator and Representative. The Game Commission has managed Pennsylvania’s wildlife resources for more than 120 years. And since 1913, when the state began selling hunting licenses to finance wildlife management, license revenue has been used to rebuild wildlife populations, protect wildlife through law enforcement, and assemble a 1.5 million-acre state game lands system to provide wildlife habitat and public hunting opportunities. The Game Commission currently manages 480 species of wild birds and mammals, most of which aren’t hunted. The Commonwealth is one of the best states in the country to hunt deer, bear, wild turkeys and elk, not to mention small game and furbearers. The agency is facing overwhelming financial challenges, many of which are beyond its control and are certain to continue into the future. Hunting license fees account for almost 40 percent of the Game Commission’s revenue. The fee for hunting and trapping licenses has not increased in 16 years: the second-longest period the Game Commission ever has gone without an increase. The longest span was from the Great Depression through World War II. The agency has been operating at a deficit since fiscal year 2013-14 and projects a deficit of $12 million in the current fiscal year primarily due to large increases in personnel expenses. Those seeking an introduction to archery likely can find it at a nearby state park. 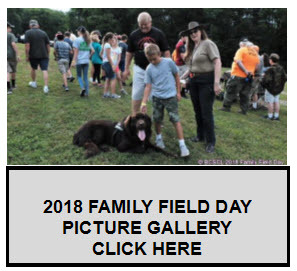 Ten state parks throughout the Commonwealth have scheduled a number of Explore Archery programs, and those looking to participate can register at the state Department of Conservation and Natural Resources event calendar at http://events.dcnr.pa.gov. 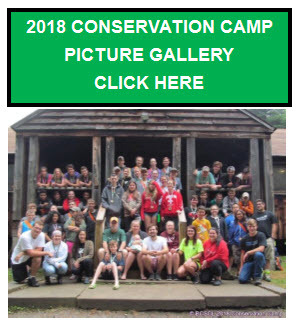 The programs are made possible through a $50,000 grant the Pennsylvania Game Commission received from the Easton Foundation. Through the grant, the Game Commission was able to place Explore Archery equipment kits – consisting of bows, arrows, targets, arm guards, finger tabs and more – at 10 Pennsylvania state parks with certified USA Archery instructors. With the kits, Explore Archery programs are planned to be held at Bald Eagle State Park, Cowans Gap State Park, Frances Slocum State Park, Jacobsburg State Park, Kings Gap State Park, Nolde Forest State Park, Ohiopyle State Park, Parker Dam State Park, Sinnemahoning State Park and Pymatuning State Park. Game Commission shooting sports coordinator Todd Holmes said Explore Archery programs provide an introduction to archery for novice shooters of all ages. Programs teach participants how to shoot a bow, and encourage the enjoyment of the outdoors throughout the year. Chronic wasting disease (CWD) affects the brain and nervous system of infected cervids (deer, elk and moose) eventually resulting in death. Chronic wasting disease (CWD) has been detected in three locations in Pennsylvania: a captive deer farm in Adams County (fall 2012 (PDF)); free-ranging deer in Blair and Bedford counties (2012 firearms season (PDF)); and a captive deer farm in Jefferson county (spring 2014 (PDF)). Following the detection of CWD in both captive and free-ranging deer in Pennsylvania, an executive order (PDF) was issued by the Game Commission to establish Disease Management Areas (DMAs). Within DMAs, rehabilitation of cervids (deer, elk and moose); the use or possession of cervid urine-based attractants in an outdoor setting; the removal of high-risk cervid parts; and the feeding of wild, free-ranging cervids are prohibited. Increased testing continues in these areas to determine the distribution of the disease. Newly confirmed cases will alter the boundaries of DMAs as the Game Commission continues to manage the disease and minimize its affect on free ranging cervids. 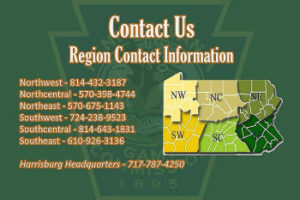 HARRISBURG, PA – The Pennsylvania Game Commission during 2015 found 12 additional white-tailed deer infected with chronic wasting disease (CWD) – all in Disease Management Area 2 (DMA 2), located in southcentral Pennsylvania.DMA 2 is the only area of the state where CWD has been detected in free-ranging deer. The latest cases bring to 22 the total number of free-ranging deer found with CWD within DMA 2 since 2012. This is the highest number of cases to be found in a single year, and more than doubles the total number of CWD-positive deer found in the wild in Pennsylvania. These new cases have resulted in changes to DMA 2’s boundaries, increasing the size of the DMA by more than 437 square miles. A map showing the latest expansion to DMA 2 has been posted online and will be included in the 2016-17 Pennsylvania Hunting & Trapping Digest that’s issued to hunters at the time the buy their licenses. However, hunters are reminded that future CWD cases could further impact DMA 2’s boundary, and the most up-to-date maps always can be found at the Game Commission’s website. Special rules regarding the hunting, transport and feeding of wild deer apply within all DMAs, and are detailed in full online. One of the new cases was found in a deer harvested by a hunter. It serves as an example of why hunters need to be taking the DMA restrictions seriously. The hunter in the case transported a buck that later tested positive for CWD from DMA 2 to a deer processor far outside of the DMA, and the high-risk parts went to a rendering plant. Transporting a deer out of the DMA is illegal. By leaving behind those parts with the highest-risk of transmitting CWD to other deer, hunters limit the chances the disease will spread to new areas of the state. The hunter in this case, which has been adjudicated, also failed to report the deer as required by law. Hunters need to be taking CWD seriously. To do otherwise, risks spreading the disease to deer and elk in other parts of Pennsylvania. In the early stages of infection, CWD tends to spread and increase very slowly in wild deer populations. This might cause hunters to have a false sense of security, and take the presence of the disease lightly.